The small market town of Wotton-under-Edge is tucked under the edge of the high western Cotswold escarpment with Nibley Hill towering above it. Nibley Hill (crowned by the William Tyndale monument) provides spectacular views across the Severn valley and nearby is the steep-sided valley of Ozleworth Bottom. Unlike many Cotswolds country towns in which the parish church, market place and principal buildings lie close to one another, Wotton-under-Edge has no recognised centre point. Its church and the Chipping, or old market place, are nearly half a mile apart and separated by the busy Long Street and High Street. The Parish Church of St. Mary the Virgin is the town's most important architectural feature. It is framed by trees and possesses a fine late 14th century tower. Although there was certainly an earlier church, the present building is no earlier than the 13th century and was consecrated in 1283. The whole church was by no means complete at the time of its consecration and reflects many structural changes over the centuries. The base of the tower, which has a notable peal of eight bells (cast in Gloucester in 1756), is of the early 14th century, while the upper stages form an admirable example of Perpendicular Gothic architecture of the late 14th century. 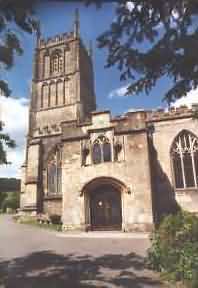 It is described by David Verey in Pevsner's Buildings of England (Gloucestershire: The Cotswolds): "It is one of the most splendid Perp towers in the county". The South porch, which bears a sundial and has a priest's chamber above, contains a restored 13th century doorway leading to the interior. With exceptionally wide aisles and only a few stained glass windows, together with clean white walls, the interior of the church gives an immediate impression of size and lightness. In 1838, a former Vicar, the Rev. Benjamin Perkins, caused the nave to be extended by two bays and the sanctuary modified and reduced to its present form. Several roof levels can be seen on the west wall. There are three groups of Almshouses, evidence of Wotton's concern for the aged, and all of which continue in use today. The earliest of these is one of the most notable examples in the town of traditional Cotswold stone building. Hugh Perry in the 17th century and Thomas Dawes in the 18th were responsible for the Almshouses which bear their names in Church Street. 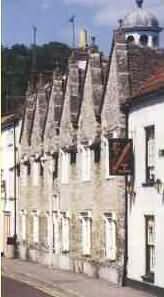 The first buildings were erected in 1638 as a result of a bequest by Hugh Perry, with accommodation for six poor men and six poor women. The building has six gables facing the street and a central domed wooden cupola. A flat-arched passageway leads into a courtyard in which is situated a beautiful, tiny 17th century chapel. The Dawes hospital of 1720 completes the rectangle on the east side. Visitors are welcome to enter this quiet enclosure, which "seems like an Oxford college in miniature" (David Verey). The second row of almshouses was founded by Miss Ann Bearpacker in 1837. They stand in two groups of five opposite the parish church, next to Parklands. An extensive programme of restoration and modernisation has just been completed, making them suitable for continued use into the 21st century but without losing anything of their traditional appearance. The Rowland Hill Almshouses, with their wooden verandas, founded in 1887 in memory of the Rev. Rowland Hill, may be seen just below the Tabernacle in Tabernacle Pitch at the top of Old Town. Tolsey House is at the corner of High Street and Market Street. This building, with its well known Victoria Jubilee clock, is much older than it appears to be as the 18th century brick facade conceals a late 16th century house with projecting upper floors. It possesses a Cotswold stone tiled roof, capped by a fine bell turret and a dragon weather vane. It was given to the town by Anne, Countess of Warwick, in 1595, originally for the poor aged and impotent, but it soon served as the Court of Piepowder with a courtroom on the ground floor and a common prison or blind house in the cellar. It is now in private ownership although the clock belongs to the Town Council. A new clock was provided in 1683 and there was a dial set on a post until Queen Victoria's Jubilee in 1887. The Town Hall stands in Market Street opposite the Star Inn, one of several ancient inns in the town. The star has a claim to fame revealed when the recent film of the Titanic came out and was shown at the Town Cinema just opposite. John Cambridge, whose father was the licensee of the Star, grew up here in the 18th century. Later he emigrated to Prince Edward Island in Canada, becoming a shipbuilder and founding the White Star Shipping Line (named after his father's inn in Wotton) which in due course owned the ill-fated Titanic. The open area in front of the Star and the Town Hall is what remains of the Stone or Stony Chipping (distinct from the Green Chipping which is now simply called the Chipping) and was where the market was held. The Town Hall was originally built as a market house in the middle of the Stony Chipping in 1698-1700, of classical proportions, rising on fifteen Doric stone columns, which can still be seen, providing a covered open market at ground level with a large room above like the similar ones in Tetbury and Dursley. The open part was enclosed and altered in 1872, with further work in 1884, giving the whole building its present mid-19th century appearance. Ursula Askham Fanthorpe (popular English poet) lived in Wotton-under-Edge for 30 years. Her poems celebrate the English landscape, history and people and many anchored in the Cotswolds. The small village of Alderley lies within the Area of Outstanding Natural Beauty in the lovely countryside south east of Wotton-under-Edge. The Cotswold Way runs through the village. The elegant Church, dedicated to St. Kenelm was re-built in 1802 but the tower, dating from 1450 was retained from an earlier building. There are a number of large as well as small houses, of which Alderley Grange, dating from the 17th and 18th centuries and Rose Hill, now a preparatory school, are perhaps the most notable. A folly on Winner Hill, over-looking the village, has recently been restored. At the foot of the hill there is a thriving trout farm. Hillesley is a charmingly situated small village, two miles south of Wotton-under-Edge. It has a Victorian Anglican School, a long-established Baptist Church, a flourishing primary school and a large public playing field. At the centre is a War Memorial green and some pleasant Cotswold stone buildings, also a comfortable 17th century public house, the Fleece Inn, providing meals and accommodation. The area is one of outstanding natural beauty with varied scenery and tracts of ancient woodland still remaining. Farm lanes and footpaths lead off in every direction, including Hareley and Assley Commons which adjoin the larger commonlands of Hawkesbury parish. To the east, the quiet Kilcott valley leads up to the Midger Nature Reserve and the Cotswold Way Walk runs through this part of the parish. Tresham is a smaller settlement on the higher ground south-east of Wotton. Old stone cottages and farms surround a little Anglican church, built in 1855, and travellers may rest at Well Hill, a recently restored amenity area with a wonderful view. A pack of walks leaflets is available from the Parish Clerk and a Hillesley Website gives more information on www.hillesley.org.uk. A mile to the south west of Wotton-under-Edge, straddling the Little Avon, lies the village of Kingswood. It has a long history, its main claim to fame being that it was once the site of an important Cistercian Abbey, as a 'daughter' of Tintern. Founded in 1139 by a member of the Berkeley family, the Abbey moved to several different locations in its early years before settling in Kingswood. Following the dissolution of the monasteries by Henry VIII, much of the Abbey was demolished and the stone and timbers used for building elsewhere. Today, only the 16th Century gatehouse and some precinct walling remain of what must have been a once imposing Abbey. The former location of the rest of the Abbey, including the church, is unknown but remains an active cause for conjecture and investigation by the local community. Like Wotton-under-Edge, North Nibley is sheltered by the south western escarpment of the Cotswolds. Set high above the village, the William Tyndale monument dominates every view. It commemorates the life of William Tyndale, the first translator of the Bible into English, allegedly born in the village at Hunts Court. Another claim to fame is the Battle of Nibley Green, the last battle to be fought in England between private armies, those of Lord Lisle of Wotton and Lord Berkeley of Berkeley Castle. Many of the bodies of the fallen were buried in Nibley Churchyard. The church itself, St.Martin's, dates from an earlier 12th century chapel which in turn was probably built on a pagan site. Inside, the Green Man, a pagan figure, is carved on one of the columns. Next to the Church is Nibley House which dates from the 17th century and was the home of John Smyth, the wealthy steward for the Berkeley Estates. North Nibley is a 'real' village, having a C&E Primary School, Shop & Post Office, the Black Horse pub and a chapel as well as the church. North Nibley is now well-known for holding an annual Scarecrow Festival in September. See images of Scarecrows. The Cotswold Way runs along the escarpment, down from the Tyndale Monument and along the street on its way to Stinchcombe Hill. It is a popular walk with visitors in the area who will find a warm welcome if they care to visit the village. Ozleworth lies two miles to the east of Wotton-under-Edge within the area of outstanding natural beauty. The valley, Ozleworth Bottom, rich in flora and fauna, is reputed to be one of the most beautiful valleys in the country. At the end of this remote valley is situated the Church, St.Nicholas of Myra, now in the care of The Churches Conservation Trust, though still used weekly for evening prayer and for some festival services. This small church is unique due to its irregular, centrally situated tower and circular churchyard. The church was known to be in existence in 1131, and the circular churchyard could denote an earlier Saxon site. Ozleworth also contains Newark Park (owned by the National Trust). Newark was originally a Tudor hunting lodge, built on the edge of a steep cliff by the Poyntz family who used stones from the ruins of nearby Kingswood Abbey. In 1790 the noted architect James Wyatt converted the lodge into a four square castellated country house. Lovingly restored over recent years by the late Robert Parsons, it is of special architectural interest and commands wonderful views towards Hawkesbury and across to the Mendips. The pretty hamlet of Wortley has several ancient and most attractive houses grouped around the winding and narrow road from Wotton to Alderley. The Chantry includes parts of a chantry chapel dating from 1311, which was used by monks from Kingswood Abbey. The remains of a substantial Roman Villa lie under the garden of one cottage. The villa has previously been the subject of several excavations by Keele University but is currently filled in and is not open to the public. Artefacts from the excavations are in the care of Stroud Museum.